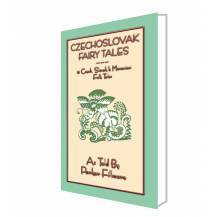 A Perfect Bound Paperback 5" x 8"
These tales have been drawn from original Slavic sources, and were chosen for their variety of subject and range of interest. 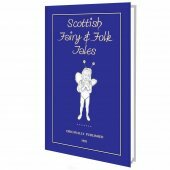 These are tales conceived with all the gorgeousness of the Slavic imagination; charming little nursery tales that might be told in nurseries the world over; folk tales illustrative of the wit of a canny people as surprising to the Anglo-Saxon imagination as they are entertaining. 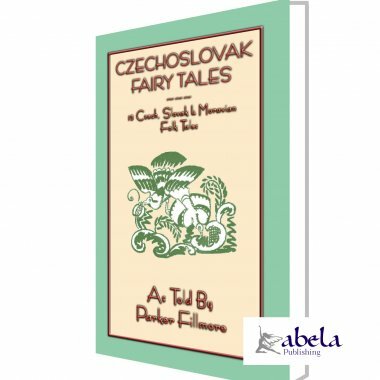 This rendering of some of the old Czechoslovak tales is not offered as a literal translation or a scholarly translation but have been retold in a way that the translator hoped would please children in the West. He has endeavoured to retain the flavor of the originals but has taken the liberty of a short cut here and an elaboration there wherever these have seemed to me to make the English version clearer and more interesting. 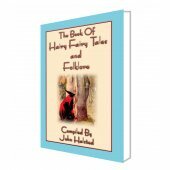 33% of the publishers net profit from the sale of this book will be donated to charities. BETUSHKA was a little girl. Her mother was a poor widow with nothing but a tumble-down cottage and two little nanny-goats. But poor as they were Betushka was always cheerful. From spring till autumn she pastured the goats in the birch wood. Every morning when she left home her mother gave her a little basket with a slice of bread and a spindle. See that you bring home a full spindle, her mother always said. Betushka had no distaff, so she wound the flax around her head. Then she took the little basket and went romping and singing behind the goats to the birch wood. When they got there she sat down under a tree and pulled the fibers of the flax from her head with her left hand, and with her right hand let down the spindle so that it went humming along the ground. All the while she sang until the woods echoed and the little goats nibbled away at the leaves and grass. When the sun showed midday, she put the spindle aside, called the goats and gave them a mouthful of bread so that they wouldnt stray, and ran off into the woods to hunt berries or any other wild fruit that was in season. Then when she had finished her bread and fruit, she jumped up, folded her arms, and danced and sang. The sun smiled at her through the green of the trees and the little goats, resting on the grass, thought: What a merry little shepherdess we have! After her dance she went back to her spinning and worked industriously. In the evening when she got home her mother never had to scold her because the spindle was empty. One day at noon just after she had eaten and, as usual, was going to dance, there suddenly stood before her a most beautiful maiden. She was dressed in white gauze that was fine as a spiders web. Long golden hair fell down to her waist and on her head she wore a wreath of woodland flowers. Betushka was speechless with surprise and alarm. Betushka, do you like to dance? Oh, I could dance all day long! Come, then, let us dance together, said the maiden. Ill teach you. With that she tucked up her skirt, put her arm about Betushkas waist, and they began to dance. At once such enchanting music sounded over their heads that Betushkas heart went one-two with the dancing. The musicians sat on the branches of the birch trees. They were clad in little frock coats, black and gray and many-colored. It was a carefully chosen orchestra that had gathered at the bidding of the beautiful maiden: larks, nightingales, finches, linnets, thrushes, blackbirds, and showy mocking-birds. Betushkas cheeks burned, her eyes shone. She forgot her spinning, she forgot her goats. All she could do was gaze at her partner who was moving with such grace and lightness that the grass didnt seem to bend under her slender feet. They danced from noon till sundown and yet Betushka wasnt the least bit tired. Then they stopped dancing, the music ceased, and the maiden disappeared as suddenly as she had come. Betushka looked around. The sun was sinking behind the wood. She put her hands to the unspun flax on her head and remembered the spindle that was lying unfilled on the grass. She took down the flax and laid it with the spindle in the little basket. Then she called the goats and started home. She reproached herself bitterly that she had allowed the beautiful maiden to beguile her and she told herself that another time she would not listen to her. She was so quiet that the little goats, missing her merry song, looked around to see whether it was really their own little shepherdess who was following them. Her mother, too, wondered why she didnt sing and questioned her. No, dear mother, Im not sick, but Ive been singing too much and my throat is dry. She knew that her mother did not reel the yarn at once, so she hid the spindle and the unspun flax, hoping to make up tomorrow what she had not done today. She did not tell her mother one word about the beautiful maiden. The next day she felt cheerful again and as she drove the goats to pasture she sang merrily. At the birch wood she sat down to her spinning, singing all the while, for with a song on the lips work falls from the hands more easily. Noonday came. Betushka gave a bit of bread to each of the goats and ran off to the woods for her berries. Then she ate her luncheon. Ah, my little goats, she sighed, as she brushed up the crumbs for the birds, I mustnt dance today. Why mustnt you dance today? a sweet voice asked, and there stood the beautiful maiden as though she had fallen from the clouds. Forgive me, beautiful lady, for not dancing with you. If I dance with you I cannot spin my stint and then my mother will scold me. Today before the sun sets I must make up for what I lost yesterday. Come, child, and dance, the maiden said. Before the sun sets well find some way of getting that spinning done! She tucked up her skirt, put her arm about Betushka, the musicians in the treetops struck up, and off they whirled. The maiden danced more beautifully than ever. Betushka couldnt take her eyes from her. She forgot her goats, she forgot her spinning. All she wanted to do was to dance on forever. At sundown the maiden paused and the music stopped. Then Betushka, clasping her hands to her head, where the unspun flax was twined, burst into tears. Remember my words: Reel and grumble not! When she said this, she vanished as if the earth had swallowed her. Betushka was very happy now and she thought to herself on her way home: Since she is so good and kind, Ill dance with her again if she asks me. Oh, how I hope she does! She sang her merry little song as usual and the goats trotted cheerfully along. She found her mother vexed with her, for she had wanted to reel yesterdays yarn and had discovered that the spindle was not full. What were you doing yesterday, she scolded, that you didnt spin your stint? Betushka hung her head. Forgive me, mother. I danced too long. Then she showed her mother todays spindle and said: See, today I more than made up for yesterday. Her mother said no more but went to milk the goats and Betushka put away the spindle. She wanted to tell her mother her adventure, but she thought to herself: No, Ill wait. If the beautiful lady comes again, Ill ask her who she is and then Ill tell mother. So she said nothing. Today, my little goats, I will dance for you! She jumped up, folded her arms, and was about to see whether she could move as gracefully as the beautiful maiden, when the maiden herself stood before her. Let us dance together, she said. She smiled at Betushka, put her arm about her, and as the music above their heads began to play, they whirled round and round with flying feet. Again Betushka forgot the spindle and the goats. Again she saw nothing but the beautiful maiden whose body was lithe as a willow shoot. Again she heard nothing but the enchanting music to which her feet danced of themselves. They danced from noon till sundown. Then the maiden paused and the music ceased. Betushka looked around. The sun was already set behind the woods. She clasped her hands to her head and looking down at the unfilled spindle she burst into tears. Oh, what will my mother say? she cried. Give me your little basket, the maiden said, and I will put something in it that will more than make up for todays stint. Look not inside until youre home! As she said these words she was gone as if a wind had blown her away. Betushka wanted awfully to peep inside but she was afraid to. The basket was so light that she wondered whether there was anything at all in it. Was the lovely lady only fooling her? Halfway home she peeped in to see. No, Ill keep whats left as litter for the goats. She was almost afraid to go home. She was so quiet that again the little goats wondered what ailed their shepherdess. Her mother was waiting for her in great excitement. For heavens sake, Betushka, what kind of a spool did you bring home yesterday? When you went away this morning I started to reel that yarn. I reeled and reeled and the spool remained full. One skein, two skeins, three skeins, and still the spool was full. What evil spirit has spun that? I cried out impatiently, and instantly the yarn disappeared from the spindle as if blown away. Tell me, what does it mean? So Betushka confessed and told her mother all she knew about the beautiful maiden. Oh, cried her mother in amazement, that was a wood maiden! At noon and midnight the wood maidens dance. It is well you are not a little boy or she might have danced you to death! But they are often kind to little girls and sometimes make them rich presents. Why didnt you tell me? If I hadnt grumbled, I could have had yarn enough to fill the house! Betushka thought of the little basket and wondered if there might be something under the leaves. She took out the spindle and unspun flax and looked in once more. Mother! she cried. Come here and see! Her mother looked and clapped her hands. The birch leaves were all turned to gold! Betushka reproached herself bitterly: She told me not to look inside until I got home, but I didnt obey. Its lucky you didnt empty the whole basket, her mother said. The next morning she herself went to look for the handful of leaves that Betushka had thrown away. She found them still lying in the road but they were only birch leaves. But the riches which Betushka brought home were enough. Her mother bought a farm with fields and cattle. Betushka had pretty clothes and no longer had to pasture goats. But no matter what she did, no matter how cheerful and happy she was, still nothing ever again gave her quite so much pleasure as the dance with the wood maiden. She often went to the birch wood in the hope of seeing the maiden again. But she never did.